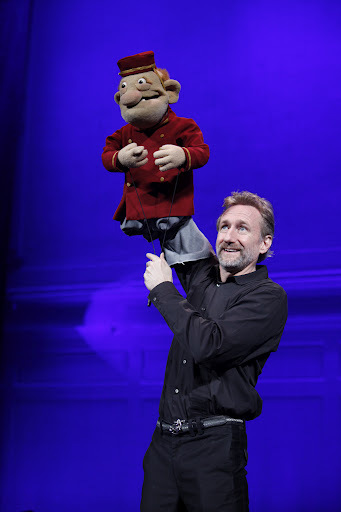 Brian Henson is chairman of The Jim Henson Company and an award-winning director, producer, writer and performer. His new live show, Stuffed and Unstrung, combines puppetry and improv in a way that has never been seen before, and is in Chicago for this year's Just For Laughs Festival. I spoke with Brian recently about his new show, his father's legacy and the future of improvised puppetry. What was the impetus for this show? Initially it was a workshop experiment that we were doing. I contacted Patrick Bristow to come work with me and a group of our top puppeteers on doing improv comedy. This was something new to our puppeteers and not something we'd ever done. We train our puppeteers in the technique of puppetry and character development, but never improv. It just felt like it could be a really great way to find the funniest that puppets can be. Initially it was just an experiment; it was workshops and they were going really really well, so we decided to put our puppeteers in front of an audience, just for fun. That organically grew into a show. There were presenters in the audience who invited us to comedy festivals around the world. So what was an experimental workshop for us to teach our puppeteers to be better improvisers, or as my dad used to call it, ad-libbers, organically became Stuffed and Unstrung. A lot of really good comedy comes from playing and improv. Exactly. Once you're there in the theater you see puppetry the way we do puppetry, mixed with short-form improv comedy, that works really really well together and becomes something new, that you've never seen. Once you're in the audience five minutes, you get it and it's deliciously fun. Most people know what improv is, and everyone knows what puppetry is, but to put them together in a show for adults is fascinating. What was that process like? At first, it didn't feel that organic. When I first sat with Patrick Bristow and described to him how we do puppets, which is that we don't ever look at the puppets. We always use a camera, hooked up to television monitors. Our training is that we watch the monitor and bring the character that you see on the monitor alive. You don't ever think about the hand or the puppet. And at first he said, "I don't know if this is going to work with improv, because in improv you're all looking each other in the eye and you're all looking at each other to make sure you can anticipate everything that's going on with the other performers." At first it felt like it could have been a terrible experiment, but once we did set up the camera, it really really worked well. Although you aren't looking at the other performers, everyone is looking at the camera frame. You can see what everyone is doing, you just have to watch very closely. We can put a character in the foreground, looking out at the audience, and the performer knows precisely what the performers behind him are doing without being able to see them. We can have characters who appear to be disconnected, but the performers are actually very connected. What is it like to do this type of puppetry for adults? There are structures and there's also a variety element to the show. There are four or five pieces that are prepared, a couple of them are reenactments of old pieces that my father developed in the '50s and '60s. We're re-staging old pieces that haven't been seen by audiences in decades. The bulk of the show is improvised and short structured, some of them have more or less shape, and some of them are spot scenes, in which the audience shouts out anything and the performers have to do a scene within that suggestion. We didn't set out to do a blue show, but what was funniest was to not tell the audience that they have to be careful what they suggest. Some of them are not dirty shows, it depends on the audience. We go with the audience, and it usually gets pulled in a very adult direction. We always try to keep it classy -- it's a classy treatment of sometimes dirty suggestions. We do it carefully. We call these guys the miscreant puppets because they are adult oriented. When I think of the Muppets, I think of children's entertainment. Everything that my dad did, he was always trying to entertain himself. They all were. Even with "Sesame Street," when Frank Oz and Jim Henson first did Ernie and Bert and Big Bird and Grover, they were trying to make themselves laugh, but also making sure the kids could follow it. I think that's why "Sesame Street" was a hit. This goes a little further than anything we've ever done, though. What would your dad think of the show? I think he would love it. I've said this to others, and it's true, it's not what I set out to do, but where we ended up is really wonderful... when I was a kid and would visit the Muppets set, the funniest thing that those guys would do was before they called action on the cameras, and when they were blocking the scene. It would get very adult, very blue, and it was hilariously funny. That's where a lot of those characters were developed, so what we've done here is captured an entire show that grabs at that naughty, fun sense of humor when you take really good, funny puppeteers and let them go, unleashed. What is the plan moving forward? More tours? We sort of go out for a week or two here and there -- we take the show out five or six times a year. The intention is not to have it go out for months on end. Chicago is so open to the show, I'd love to come back again. It will be really interesting to see this show in Chicago, which is an improv city. We're a little scared -- you're the most discerning audience for improv, but at the same time everyone loves what we're doing. They're not quite the same rules, and the fact that you have puppets distorts it a little bit, and everyone sees the delightful difference. It's a very close relative to actors improvising, but it isn't. This will continue and I will hopefully get more troupes going out. What's great about this show is that it keeps developing. Every night is different, and every month is quite different. Stuffed and Unstrung will continue to be a big part of my life. I will keep doing this. And then I have a couple of movies and some TV shows that I'm working on. I'm trying to stick more to creating this stuff, as opposed to running the company. My sister Lisa is now running the company, she is the CEO and I'm the chairman. This is working very nicely right now and allows me to do some of the creative stuff and concentrate on that. I do have a movie that is scripted, but in the tone of Stuffed and Unstrung. Hopefully I'll be shooting that in the next few months -- it's called Happy Time Murders, it's a film noir murder. Was there a moment in your life when you considered doing something other than this? As a kid I wanted to be a physicist, but I always did really well in the arts. I started working at 19, I didn't even finish college. I just started doing movies. At that point I knew I wanted to be in film, but was really enjoying special effects, visual effects, the animatronic puppets and directing. Very quickly I realized that there were a lot of aspects of film making that excited me. The other thing is, my dad's rule was that he could not do the same thing for very long. The only reason why "Sesame Street" has lasted so long is that he moved on, but would come back and visit. He cancelled "The Muppet Show" after only five years because he wanted to move on and do something else. In some way it's very easy to work in this company because it's easy to be here and still work on new things. What is your advice to young artists? One thing that is so great now, which was not true even 25 years ago, is the quality of the puppets. As my dad would say, a really good puppeteer can take a wooden spoon, a coffee cup and a magic marker and make the funniest puppet you've ever seen. Anybody who wants to be in puppetry can set up a home video camera and start doing stuff... that's the best way to learn. My main advice to people is to just start doing it to see if it excites you. If it excites you it and inspires you, that will make you keep doing it and you can create work that you can show people like me. When someone comes to me and wants to be a puppeteer, the first thing I say is, "Show me what you've done." You just have to start. Stuffed and Unstrung is running at the Bank Of America Theater, 18 W. Monroe St., through June 17. Tickets and more information can be found here.